Black Barlow is, in a word, dramatic. 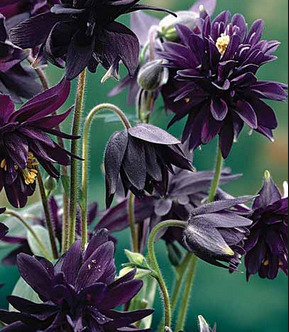 Displaying fully double, sparsely spurred, black flowers, this spring beauty will turn heads, guaranteed, Often referred to as the Clematis columbine, this variety was breed as a cut flower specimen and true to form it is an outstanding and unique addition to vase arrangements, Like all Columbines, Black Barlow self sows so deadheading is advised unless you enjoy happy wanderers in your border, Also performs well in containers but can become dishevelled in appearance in summer. 1 No 1/pkg.